Perched above its own arroyo, this quintessentially Sonoran home awaits. OWNED SOLAR! 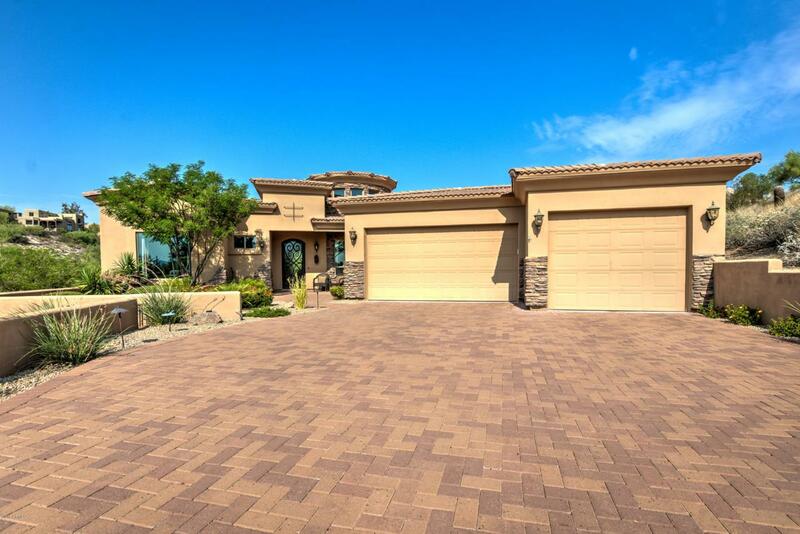 Luxury meets convenience with a step-free split floor plan and easy maintenance. 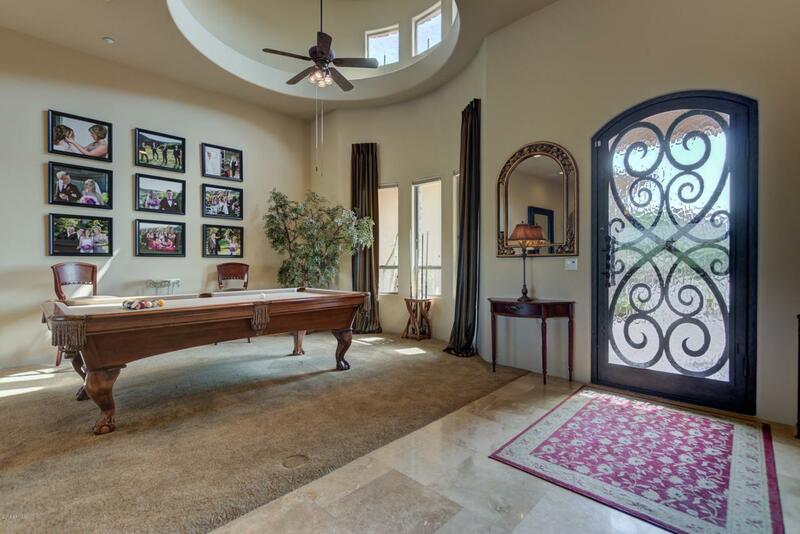 Enter this gracious home through a custom iron front door and instantly notice walls of glass with beautiful views, soaring ceilings, arched doorways, and an open living and dining room with travertine flooring in all the right places. Just off the family room, the Chef's kitchen is a true delight featuring stunning slab granite with breakfast bar, a fantastic 48'' Wolf six-burner gas range with griddle and double ovens, Sub-Zero refrigerator, Asko dishwasher, under-counter drawer microwave, and convenient breakfast area. 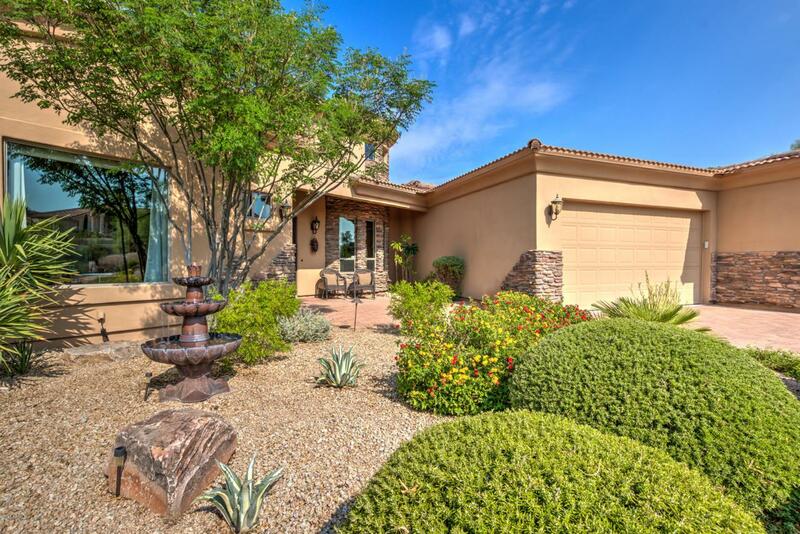 The master retreat invites complete rejuvenation with beautiful pool and desert views, two-wayfireplace between the bedroom and regal soaking tub, separate travertine stone shower, his and hers vanities with makeup desk, large walk-in closet, and private patio access. The second bedroom acts as its own master, split from the rest, with its own full bathroom and tranquil fountain courtyard and mountain views. The third and fourth bedrooms are privately situated on the right wing of the home with desert views, where guests or loved ones may each enjoy their own private bathroom. Step onto the back patio and enjoy an oasis perfect for any Arizona season, complete with a large covered patio, electronic wireless sun shades, dual-zone high pressure custom misting system, spacious open-air paver brick patio, sparkling saltwater pool with water features, custom party lighting, citrus trees, and gorgeous desert views. Sunsets are incredible from this property. 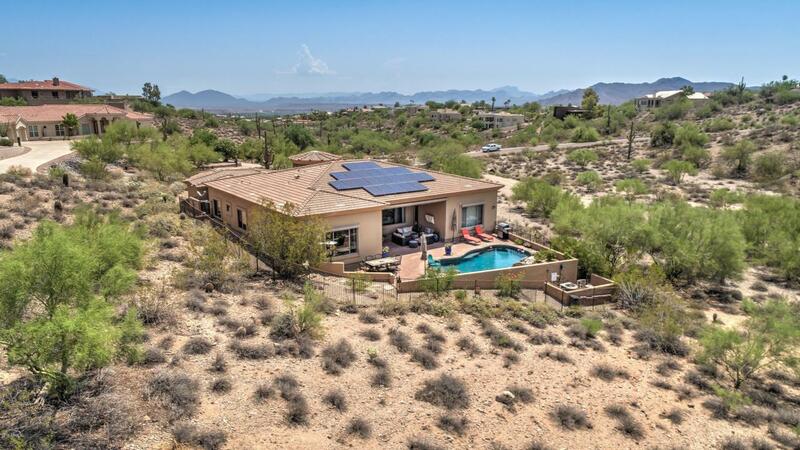 Hidden features of this home include a 30-panel 7.95 kw OWNED SOLAR SYSTEM installed in 2016, energy-efficient LED lighting inside and out with dimmers, seven-zone, multi-room sound system with amp/sub/receiver, energy-efficient, variable-speed pool pump, and much, much more!